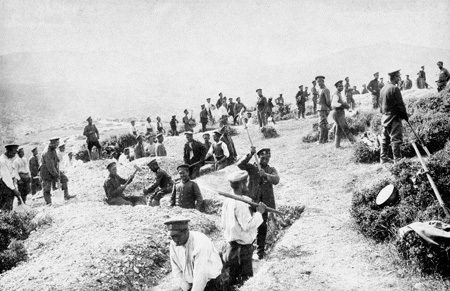 The campaign along what is now the Greece-Macedonia boarder, known as the Salonika front, is one of the least studied and explored parts of the First World War. The line was established in 1915 by the allied forces in an attempt to protect Serbia against attacks from the combined Bulgarian, Germans and Austro-Hungarian forces. Serbia however still fell, and once again the opposing forces found themselves dug in facing each other in stalemate. Various actions took place over the next three years, until a massive allied advance in September 1918 saw the collapse of Bulgaria and the liberation of Serbia. However, it wasn't just the fire power of the enemy that troops from both sides had to deal with whilst stationed on the Salonika front. Some of the most defining features of this campaign were completely out of the control of those stationed there; weather, terrain, infrastructure all played their part in making this one of the most uncomfortable and difficult postings. This article outlines some of the major issues faced by both sides, and some of the quirkier features of the campaign that distinguish it from the rest of the war. It is well documented that the trenches on the western front were infested with rats and lice, but the biggest plight on Macedonian front was pesky mosquitos. They may be less intrusive than rats, however they do carry malaria, a deadly disease (as it still is today). 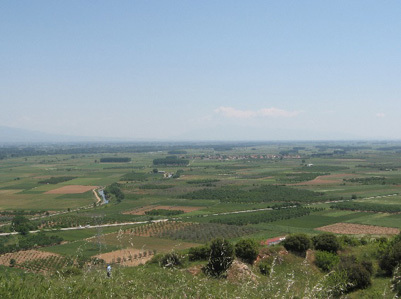 It became so unbearable and costly during the summer months that in the Struma Valley (where the British XVI Corps) that both sides withdrew from the frontlines and into the foothills. This would create a stretch of no-man's-land up to 12 miles wide, and made standard attacks all but impossible. 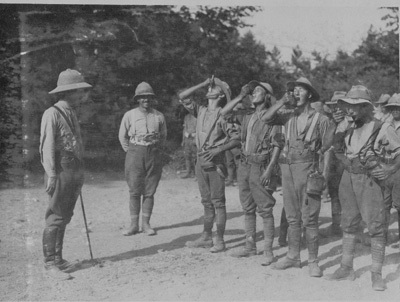 Throughput the campaign the British Salonika force suffered 481,000 non-battle causalities, 162,000 of these were victims of malaria. This total is 20 times more than the number of battle casualties. The front was low on the government's priorities, and therefore fresh troops were at a premium. Most medical services were also only voluntary organisations, so the drain on their resources pushed them to breaking point. 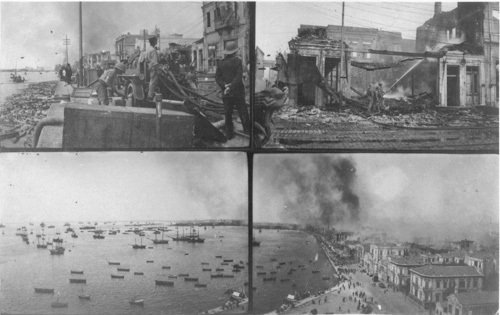 On the afternoon of 18 August 1917 a fire broke out in the Turkish quarter of the city of Thessaloniki and spread quickly amongst the tinder-dry wooden buildings. The city streets were soon full of civilians trying to save themselves and their possessions for the raging flames. Troops from all the Allied nations took part in fighting the fire and rescuing civilians. By the time the fire burnt itself out on 20 August over 9,000 buildings had been destroyed, making 80,000 people homeless. Above are some post cards from the aftermath of the fire, which rather macabrely were sold for charitable donations to rebuild the damaged buildings and help those who were made homeless. By late 1916 the Allied force comprised 600,000 men in six national contingents: French, British, Serbian, Russian, Italian and Greek (National Defence Army). 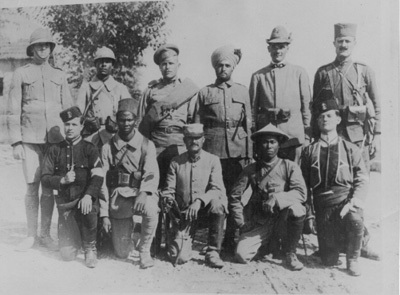 Also involved were colonial soldiers from India, Indo-China and North and West Africa. 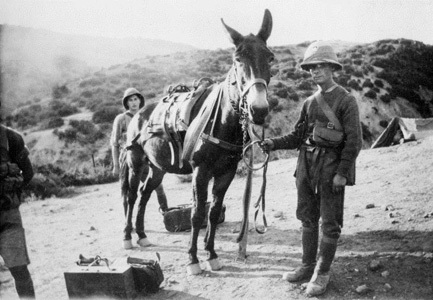 For transport and construction work behind the front line the British also employed volunteer units such as the Macedonian Mule Corps and Maltese Labour Corps. Canadian, Australian and New Zealand medical personnel were also part of the BSF and the voluntary Scottish Womens' Hospital had units attached to the Serbian Army. With the huge number of cases of malaria and other diseases, the voluntary hospital units were crucial on the Macedonia front and their work must not go unnoticed. On the other side were around 400,000 troops representing all four members of the Central Powers, with the overwhelming majority being Bulgarian. German specialist units including heavy artillery, machine-gun companies and engineers were assigned to the Bulgarian 1st and 2nd Armies to improve firepower and combat efficiency of these formations. As with her other allies, Germany also supported Bulgaria with major reinforcements at times of necessity. Turkish and Austro-Hungarian units also served in limited numbers in Macedonia, the former against British forces in the Struma Valley during 1916 and 1917. The impressive mix of nationalities across what was a comparatively short line is one of the defining features of the campaign, however it would have posed its problems.  Differing tactics, quality of equipment, and languages would have made orchestrating combined attacks difficult to say the least. Each nation also had different priorities, the strongest forces (British, French and German) that would have made the most difference in the campaign were pre-occupied with the crucial situation on the western front. This left smaller, less equipped armies with no one in real command. There was also a political crisis in the would-be neutral Greece between the pro-German king and the pro-allied prime-minister which confused the situation further. The quality of road in the area were poor to say the least, which made moving men and heavy equipment to the frontline a logistical nightmare. In fact one of the reasons Serbia fell in 1915 was due to the allied forces being slow to arrive at the front due to the poor conditions. In the hills and ravines of Macedonia wheeled transport was all but useless, however there was an unsung hero of the campaign, Mules. Not only did they help move equipment and supplies to the line, but also evacuated the wounded and sick back to the Field Hospitals behind the lines. The Salonika Campaign was fought along a 250 mile front, running from Albania to the mouth of the River Struma in Greece. 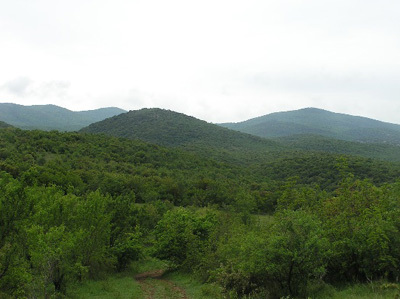 Here were found wide open valleys and plains, tangled masses of hills and ravines such as those at Doiran and towering mountains. A number of large lakes were also a feature of the region, which would have proven a haven for those dastardly mosquitos. This mixture of terrain called for different styles of warfare both in terms of offence and defence and may go some way to explaining why a major breakthrough wasn't made until the spring of 1918. The BSF covered 90 miles of front line including Doiran, where the British fought their two major battles of the campaign, and the wide Struma Valley, where small-scale operations were the norm and the effects of malaria were greatly felt. 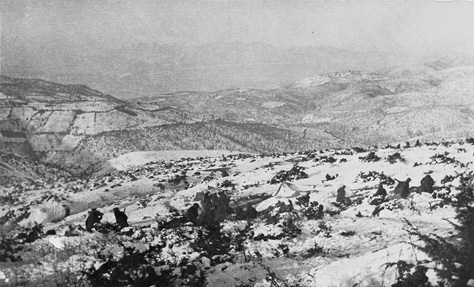 The often difficult Macedonian landscape was made more challenging by extremes of summer and winter weather. This factor tended to restrict active military campaigning to April - June and September - October each year. With the arrival of summer came temperatures of up to 112?F in the shade. 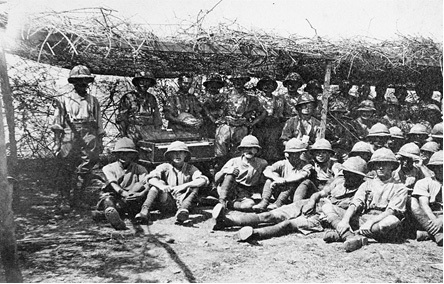 During this enforced rest period men took under whatever shade could be found. This is not to say that summer afternoons provided a welcome break from the hardships of campaigning as swarms of insects and general boredom tried men's patience. In contrast during winter, troops experienced blizzards, freezing winds, severe hail storms and heavy rain interspersed with occasional, spring-like, mild days. Probably the worst conditions occurred during the winter of 1915, when the British and French attempted to support the Serbian Army. Little in the way of proper shelter was available for the men and winter clothing was in short supply. By early December, 10th (Irish) Division had evacuated 23 officers and 1,663 men to hospitals at Salonika suffering from frostbite and exposure. By the following winter, with Allied forces well established in Macedonia and base depots supplying most of the troops needs, the men did not suffer to the same extent. Even so, with most front line soldiers having little accommodation beyond dugouts, tents or bivouac shelters, conditions were primitive and winter remained a losing battle against the elements. All of these elements make the Salonika campaign a fascinating one to study. Many different nations fighting side by side in terrible conditions, over impassable terrain and roads, fighting against boredom, disease and obviously the enemy in an unstable 'neutral' country. All these features of the campaign make it surprising that such little time is dedicated to telling its story and its battlefields are so seldom visited, despite being amongst the best preserved. Hopefully with the increased awareness of the war over the centenary, the Salonika campaign will come more to the forefront in the remembrance of Britain and its former colonies. The guide of our Salonika tour, Alan Wakefield, currently holds the position of Chairman of the Salonika Campaign Society and is a member of the British Commission for Military History. He has extensively researched the campaign and over the past decade has led many tour groups to the battlefields. All this culminating in the publishing of his book 'Under the Devils Eye'. Under the Devil's Eye by Alan Wakefield http://amzn.to/2zLCiyS.